Find device-specific support and online tools for your DROID MINI by MOTOROLA. Visit Motorola's support website for more help with your device. Learn how to power on and off your Droid Mini by Motorola. Learn how to share pictures with Bluetooth on your Droid Mini by Motorola. Learn how to pair your Droid Mini by Motorola with your Bluetooth headset. Discover how to turn Bluetooth functionality on and off with your Droid Mini by Motorola. An interactive guide to using your voice to place a call with your Droid Mini by Motorola. Discover how to place a call to a contact using your Droid Mini by Motorola. Learn how to call a new number using your Droid Mini by Motorola. A visual guide for returning to a call on your Droid Mini by Motorola. Learn how to switch between two incoming calls on your Droid Mini by Motorola. Learn how to teach your children how to call 911 on your Droid Mini by Motorola. Discover how to access the camera settings on your Droid Mini by Motorola. A how-to guide for adjusting video setting for easy message sending on your Droid Mini by Motorola. Discover how to switch from the rear to the front-facing camera while recording a video with your Droid Mini by Motorola. Discover how to change from the rear to the front-facing camera while taking a picture with your Droid Mini by Motorola. Discover how to edit a picture on your Droid Mini by Motorola. Learn how to record a video using your Droid Mini by Motorola. Discover how to set up Droid Zap using your Droid Mini by Motorola. Learn how to set pictures as the wallpaper on your Droid Mini by Motorola. Learn how to share photos using your Droid Mini by Motorola. A how-to guide for sharing videos on your Droid Mini by Motorola. Learn how to take a picture using your Droid Mini by Motorola. Learn how to take a picture while recording a video using your Droid Mini by Motorola. Learn how to take a picture from the Lock screen using your Droid Mini by Motorola. Discover how to turn on the camera's flash for your Droid Mini by Motorola. An interactive guide on how to use Droid Zap to send content using your Droid Mini by Motorola. Discover how to Quick Capture to take a picture by twisting the phone with your wrist from any screen on your Droid Mini by Motorola. Learn how to zoom in and out for video on your Droid Mini by Motorola. Discover how to zoom in and out for the camera using your Droid Mini by Motorola. Learn how to add a new contact on your Droid Mini by Motorola. A step-by-step guide for adding adding a contact to a group on your Droid Mini by Motorola. Discover how to add a picture to an existing contact on your Droid Mini by Motorola. A step-by-step guide for adding adding and deleting a contact from your favorites list on your Droid Mini by Motorola. Discover how to create a group of contacts for easy messaging to all members at once on your Droid Mini by Motorola. A visual guide for sharing a contact's information with another contact on your Droid Mini by Motorola. Discover how to view a missed call and add the number as a contact on your Droid Mini by Motorola. Discover how to acess the Settings on your Droid Mini by Motorola. A visual guide for saving energy on your Droid Mini by Motorola by adjusting the screen timeout. Discover how to change the ringtone on your Droid Mini by Motorola. An interactive map of the most important features of your Droid Mini by Motorola. An interactive guide for setting screen security to help keep others from using your Droid Mini by Motorola. A visual guide for setting your Droid Mini by Motorola to silent. An interactive guide for setting your Droid Mini by Motorola to Airplane mode. Learn how to forward an email using your Droid Mini by Motorola. Learn how to add an attachment to an email on your Droid Mini by Motorola. A visual guide for replying to an email on your Droid Mini by Motorola. A step-by-step visual guide for sending an email using your Droid Mini by Motorola. Learn how to set up a corporate email account on your Droid Mini by Motorola. Discover how to set up a personal email account on your Droid Mini by Motorola. Discover how to organize apps into a folder on a Home screen of your Droid Mini by Motorola. Learn how to add widgets and apps to a Home screen on your Droid Mini by Motorola. A visual instruction guide for moving widgets and apps on a Home screen of your Droid Mini by Motorola. Learn how to remove widgets and apps from a Home screen on your Droid Mini by Motorola. A visual instruction guide for resizing widgets on your Droid Mini by Motorola. An interactive guide for changing the mobile hotspot security settings on your Droid Mini by Motorola so you can control who uses your Internet connection. Discover how to activate the mobile hotspot feature of your Droid Mini by Motorola. Learn how to bookmark a website on your Droid Mini by Motorola. 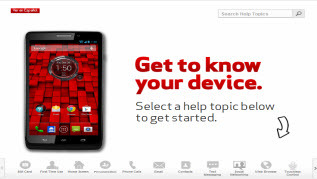 An interactive guide for navigating to a website using your Droid Mini by Motorola. A visual walkthrough of opening and closing a window in the web browser of your Droid Mini by Motorola. An interactive guide for searching the web by voice using your Droid Mini by Motorola. Learn how to switch between windows in the web browser of your Droid Mini by Motorola. An interactive guide for changing the language settings on your Droid Mini by Motorola. An interactive guide for locking and unlocking the screen to help keep you from using your Droid Mini by Motorola while it's in your pocket or purse. Learn how to set up shortcuts on the Lock screen pages of your Droid Mini by Motorola. Discover how to access and clear the Notification Panel of your Droid Mini by Motorola. Discover how to access and close open apps on your Droid Mini by Motorola. A visual guide for navigating multiple Home screens while using your Droid Mini by Motorola. Learn how to use Active Notifications on your Droid Mini by Motorola. An interactive guide on how to use NFC to share content using your Droid Mini by Motorola. Discover how to insert a nano SIM card into your Droid Mini by Motorola. Learn how to remove a nano SIM card from your Droid Mini by Motorola. Learn how to set up Touchless Control on your Droid Mini by Motorola. Learn how to get directions using Touchless Control on your Droid Mini by Motorola. Learn how to forward a text message from your Droid Mini by Motorola. A visual guide for ignoring a call and responding with a text message on your Droid Mini by Motorola. Learn how to reply to a text message on your Droid Mini by Motorola. Learn how to send a text message with your Droid Mini by Motorola. An interactive how-to guide for using your voice to send a text message with your Droid Mini by Motorola. Discover how to attach a video to a text message using your Droid Mini by Motorola. Learn how to capture a picture of your phone's screen and view it on your Droid Mini by Motorola. Learn how to use your Droid Mini by Motorola to connect to the Internet using a Wi-Fi network. Learn how to turn off Wi-Fi notification on your Droid Mini by Motorola so you'll no longer be alerted when entering a Wi-Fi network.